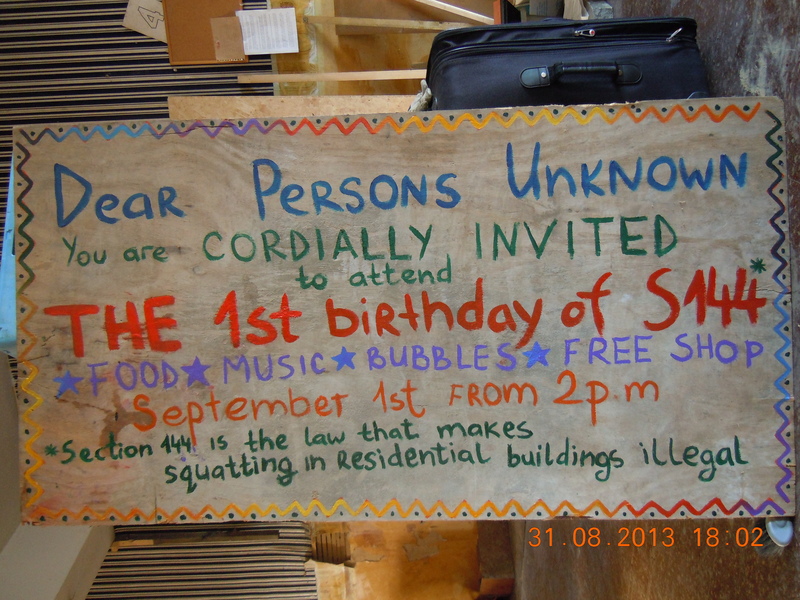 On 1st September, it’ll be one year since the ban of residential squatting. Commercial buildings are still legal to squat and we can celebrate what we have here in the Elizabeth Fry building. To commemorate the ban, we will be having a one year birthday party – yaaay! We’ve been putting together an installation to share with everyone. Join us for BBQ and music, our infamous bubble shows and a fantastic free shop. So come down on the 1st September from 2pm and join us for a great afternoon. The Dalston Eastern curve is kindly donating compost to us and we have got the super fit people from the Good gym to run there and collect the compost to bring here share with our front garden. What an awesome way to work out as a team. On the same day we will be receiving a van full of bicycle parts so we can get the bike shop up and running, as well as lots of stuff for our free shop. We will be having an Open work day and everyone is invited to come along and help us make this space function. Gardening workshop We’ll be starting to plant seeds in the front garden and planning for winter vegetables. If you have your own tools, please bring them as we really don’t have that much. We will use this day to do as much as possible to have 195 up and running in the coming weeksPlease come and join us for a day of communal fun and productivity. . Get involved and show your support. Updates on upcoming events by 195 Mare street is licensed under a Creative Commons Attribution-NonCommercial-NoDerivs 3.0 Unported License.